The terms “hot” or “cold” refer to the temperature range where the cracking occurs, in the semisolid mushy zone or below the solidus, respectively. 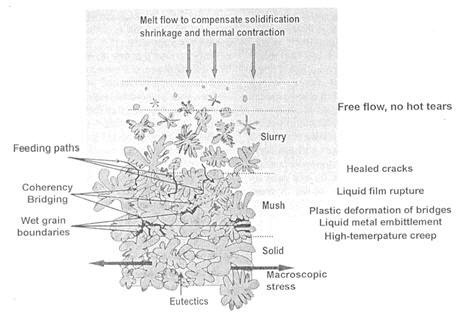 In DC casting, the name “mushy zone” is frequently applied to the entire transition region between liquidus and solidus, which is misleading, as the semisolid mixture in the top part of the transition region is actually slurry, because the newly formed grains are still freely suspended in the liquid. Only after the temperature has dropped below the coherency temperature is a real mush formed. 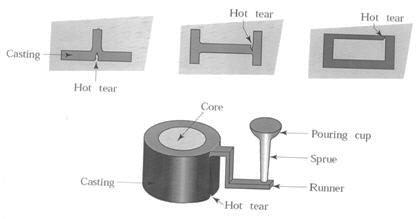 On the microscopic level, the solidification shrinkage and thermal contraction impose strains and stresses on the solid network in the mushy zone, which creates the conditions for hot tearing. Another important correlation –between the hot cracking susceptibility and the composition of an alloy– has been established on many occasions. A large freezing range of an alloy promotes hot tearing because such an alloy spends a longer time in the vulnerable state in which thin liquid films exist between the dendrites. The liquid film distribution is determined by wetting of grain boundaries, i.e., by surface tension between liquid and solid phases. When the surface tension is low and wetting is good, the liquid tends to spread out over the grain boundary surface, which strongly reduces the dendrite coherency, weakens the mush, and may promote hot tearing.